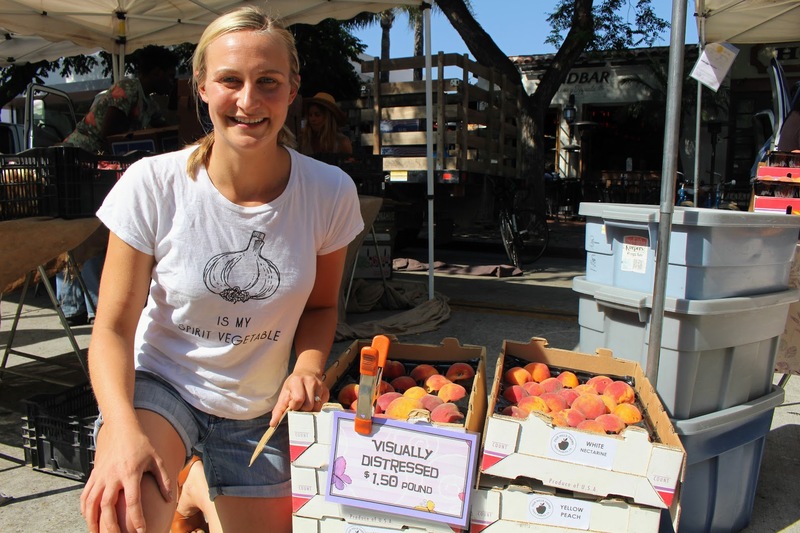 For some people, a trip to the farmers market is the highlight of the week. But for others, it can be an intimidating experience. There’s a lot to choose from and since the produce is picked when it’s ripe, shelf lives are shorter than what you generally find in grocery stores so you want to get cooking sooner. That’s why Michelle Aronson built a business around teaching people how to shop, cook and eat like a farmer. Through Farmbelly, she offers farm to table cooking classes, workshops, and video demos (plus she created a super-fun spirit vegetable quiz). Do a lap around the market before buying anything so you can check out the produce and compare quality and prices. Plan out meals ahead of time and write a list to avoid being overwhelmed, but leave room to follow your creativity try out new veggies that aren’t on your list. When in doubt, ask the farmer/farm stand vendor for recipes and cooking tips for new produce you’d like to try. Don’t be afraid of “ugly” produce – especially things like slightly bruised tomatoes (which are perfect for soup and sauces) and lightly blemished stone fruit (which taste exquisite when baked in a pie or crisp). Just ask if the farmer has “seconds” and you’ll often find these imperfect (but perfectly delicious + nutritious) fruits and veggies at a discount. Use whole vegetables to reduce food waste and maximize your dollar. For example, don’t toss those beautiful beet greens! Beet tops are wonderful sautéed, added to stir-frys, blended into smoothies, or incorporated raw in a salad. Ready to cook? Here’s a recipe Michelle is especially psyched about right now. Cook the quinoa: Bring 3 cups of water and 1/2 teaspoon kosher salt to a boil in a medium-sized saucepan. Stir in the quinoa, reduce heat to low and simmer, covered, for 15 minutes. After 15 minutes, turn off the heat and allow quinoa to steam with the lid on for 5 minutes, then uncover and fluff with a fork. Spread out quinoa on a large rimmed baking sheet and let cool. Make the lemon vinaigrette: Juice your lemons and pour the juice into a mason jar. Add twice as much olive oil as lemon juice to the jar. Add a good squeeze (about a teaspoon) each of mustard and honey. If you’d like, add minced garlic, fresh herbs, and/or lemon zest for added flavor. Add salt and pepper to taste and shake, shake shake! Taste the dressing and adjust seasoning as necessary – you’re looking for a good balance between sour, sweet, and salty. Transfer cooled quinoa to a large salad bowl, mix in 1/2 cup of your vinaigrette and stir to combine. 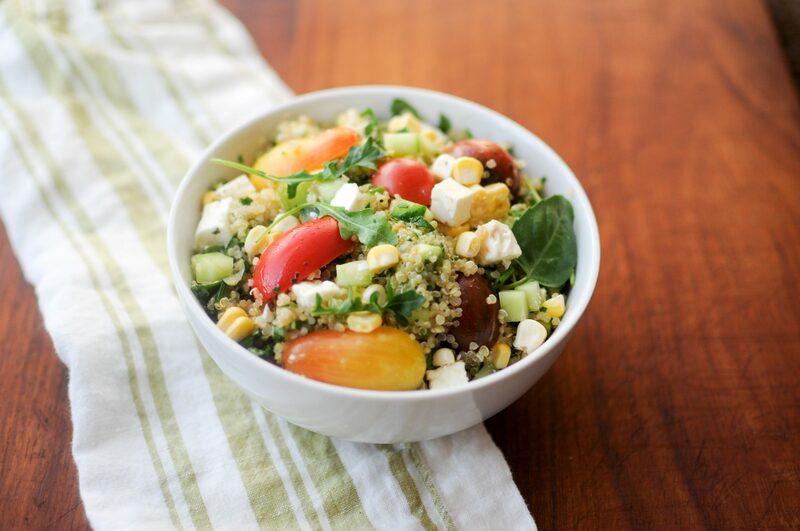 Add the sliced red onion, diced cucumber, halved tomatoes, avocado, corn kernels, feta cheese, arugula and chopped herbs to the bowl with the cooked quinoa. Pour in the remaining vinaigrette and stir gently to combine. Taste and adjust seasoning as needed. Serve warm or at room temperature. Keeps for several days in the fridge.